Glad to hear you had some time this weekend and you have a whole week off! Way to go you on the midterm - brag away, girl, you have every right with a score like that!! Can't wait to see the outer space bedroom... what a fantastic choice! Oscar gets all excited whenever the beginning credits of Star Trek: The Next Gen comes on... it's so sweet. I think our boys will have lots to chat about over Skype when they're older!!! Swords are so much fun! 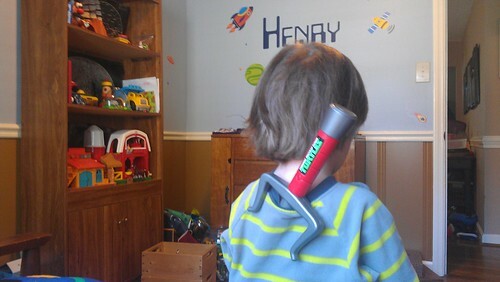 That picture so made me miss my son at that age--so fun and resourceful! So glad you had a lovely weekend - you deserve a break. Andddd can't wait to see Henry's room! Beautiful blog! He's so cute having that sword on his back.